Week 11 Green Bay Packers Power Rankings! ESPN.com – 15 (13) – Eddie Lacy was hit at or behind the line on 10 of 14 rushes Sunday, the fourth time a player with 10 rushes finished with a negative yards before contact average. CBSSports.com – 18 (13) – It’s amazing what losing a great quarterback like Aaron Rodgers can do to a team. If he doesn’t get back soon, they are done. NFL.com – 14 (13) – A difficult spot for Scott Tolzien to be in was made even more arduous by Jason Pierre-Paul’s pick-six Sunday. Putting that disaster aside, we should note that the Packers were able to put up 394 yards without a running game. Remember that Green Bay next hosts a Vikings team that is similarly quarterback-deficient (though the Packers, of course, have an excuse), so if — IF — Aaron Rodgers can come back by Turkey Day, the NFC North still should be within reach. The Lions’ loss in Pittsburgh was huge. So the Packers only fell five spots in one of the rankings? Wow, these guys must truly believe that the Lions and Bears are catchable. Tolzien hasn’t looked awful and another full week of practice could get the Packers a win over the Vikings, but you’ll have to check that out when the preview comes out. The Green Bay Packers (5-3) took a 27-20 loss to the Chicago Bears (5-3) on Monday Night Football to create a tie for first in the NFC North. Due to tie breakers the loss actually moves the Packers down to 3rd in the division and out of the playoffs. To make matters worse the Packers lost Aaron Rodgers on the final play of the opening drive of the game to shoulder injury. There is no diagnosis as of yet which means there is no time table for return. Early indications show a small fracture in Rodgers collarbone, which would keep him out about 3 weeks. Still waiting on more tests. More definitive scans today but initial tests showed small fracture in Aaron Rodgers' collarbone that could sideline him about three weeks. Seneca Wallace came in for Rodgers and looked slow. I thought it was going to be ok when Rodgers went out because I was under the impression that Wallace had some speed, but alas I was wrong. 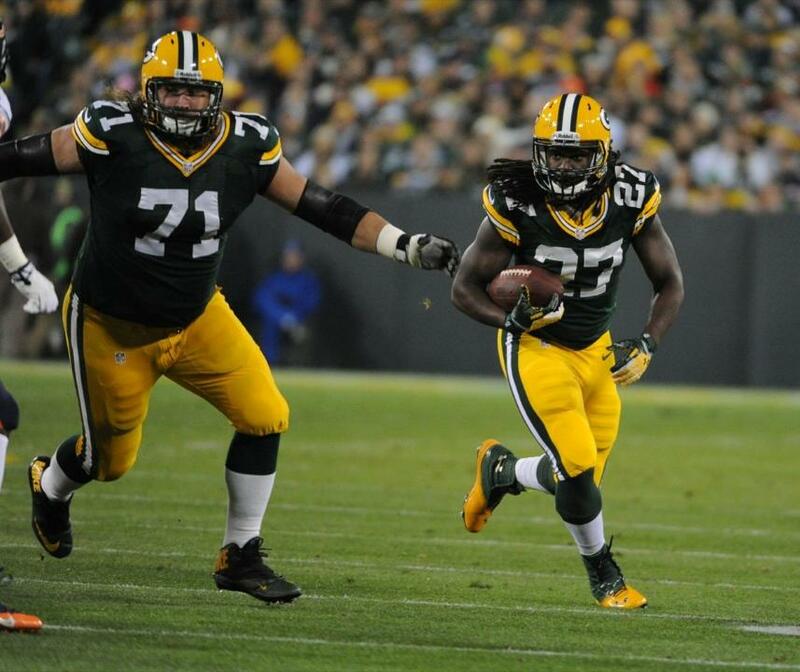 If we are talking Packers player of the game, then Lacy was the right pick here (so I’d give that pick an A grade). The only issue is the Packers didn’t win and you can’t be player of the game. This has to go to Josh McCown. McCown stepped in to the Bears starting line-up after two weeks of practice and played a great game. Maybe he should have been picked off twice, but he wasn’t and instead stayed calm, bought time and made perfect throws. McCown finished the game with 272 yards and 2 TDs. Since I picked Green Bay to win and they didn’t Grade F. Easy as that. 1. 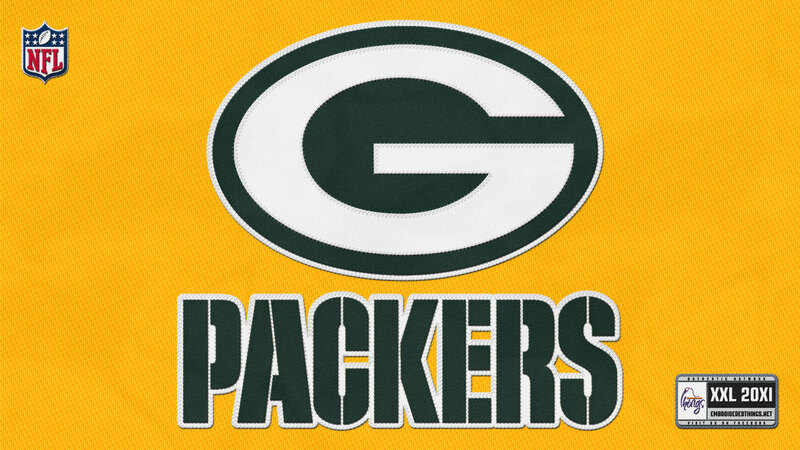 The Run Game – Another 199 yards on to the Packers already great running game. Rodgers injury is going to cause them to lean more on the run, so it was good to see that Lacy and Starks were able to run with no presence of a passing game. 2. Special Teams – I said it all in the Devin Hester section. Special teams played great and there is another spot the Packers are going to have to keep going to help the team survive Rodgers injury. 3. Penalties – There were none. Very clean game out of the Packers, you would have thought with how many times the Packers ran the ball there would be one holding call. 1. QB Pressure – Or lack thereof. If you look at the stats you’ll see a sack and 5 QB hits, but watching the game McCown was able to sit very comfortably in the pocket. There is no doubt in my mind that Clay Matthews plays next week even after just getting the pins in his thumb out. The defense is going to need to carry the Packers and the pass rush will have to lead the way. 2. Turnovers – This defense has been bend don’t break and they are still that way. If they can start creating turnovers they may be able to get rid of that stigma. Casey Heyward needs to become the ball hawk he was last year. Tramon Williams dropped an interception that would have been huge. 3. Not Challenging – How does Mike McCarthy not challenge the Andrew Quarless catch on the sideline? It’s not like they didn’t have time. I don’t always question McCarthy, but this Tuesday I am. Seneca Wallace was not ready to be thrown into action. I can’t believe I said this last night, but I wish the Packers kept Vince Young. Young could have at least escaped a few of those sacks and got more running yards out of the play. Why is Wallace making a decision to throw the slant and not run the ball. Peppers was unblocked because Bahktiari was blocking for a run that was going to the right. Terrible decision Wallace, but let’s get a week of practice under his belt and hope that he can get it together. Do the Packers bring back Matt Flynn? The Philadelphia Eagles (4-5) coming off a dismantling of the Oakland Raiders with Nick Foles throwing for 7 TDs. What Eagles team is going to show up? For the Packers sake let’s hope its the team that didn’t score a TD in 8 quarters. Just sharing the knowledge from the inside of the Packers organization. I think that most people would say that it would be automatic that Matt Flynn comes back to the Packers, but I just don’t know. Only time will tell, but it seems as though Mike McCarthy will not bring him back. Former Packers QB Matt Flynn was released by the Oakland Raiders on Monday, prompting media speculation as to whether the Packers might pursue him as a backup to Aaron Rodgers, a job Flynn held for four seasons (2008-11). Head Coach Mike McCarthy didn’t sound as though the Packers would be making any changes at the quarterback position at this point. Seneca Wallace is Rodgers’ current backup, with Scott Tolzien on the practice squad. Both players were signed following training camp this summer, after Graham Harrell and B.J. Coleman were released. 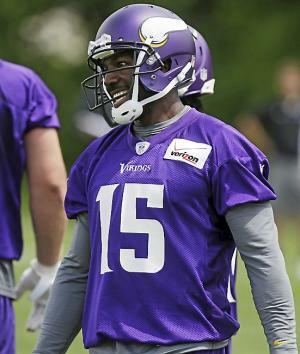 Greg Jennings is Out of His Mind! So Greg Jennings is crazy right? Is it because he realized that he has Christian Ponder throwing to him this year and not Aaron Rodgers? He says that he loves the make-up of the Vikings and that’s why he picked them. I’m sorry Greg, you picked the Vikings because they were the only ones that were willing to pay you. You wanted the money and that’s why you left Green Bay and that’s ok, just admit it! Say that I really liked the money the Vikings offered and I want to be a number one receiver, two things the Packers could not offer! Truthfully the Vikings are one Adrian Peterson knee injury away from a 2-14 season. I know everyone will say that the Packers are only one knee injury to Rodgers away from being a terrible team, but I would disagree with people here because I think believe that the Packers could turn an 8-8 season with an average quarterback. The Vikings are going to struggle to get to 8-8 with Peterson. On to this brainwashing thing. What is a team supposed to think, yes every team in our division is better than us? That’s ridiculous! Look I am not a Patriots fan, but I loved when they would put a team away because they wanted teams to know they were better! That’s what great teams do, they believe they are better and create an organizational culture that believes it. You know what? I’ll say it, right now the entire division is tiers below the Packers. If the Packers weren’t better they would have overpaid for Greg Jennings and signed free agent running backs like Steven Jackson to a ridiculous contract! These are two moves I wanted them to make, guess what? I think that Eddie Lacy has Sjax potential and is much cheaper! The Packers draft great and develop their talent, so yes they are MANY tiers above the NFC North. 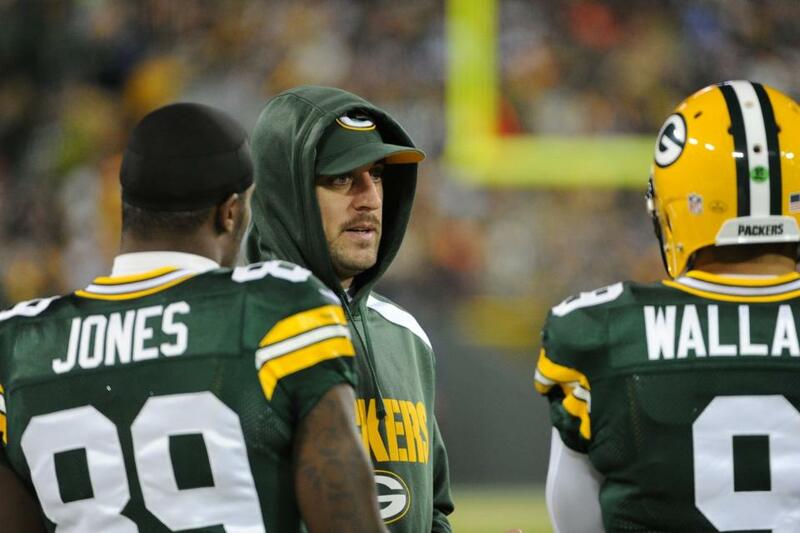 Greg Jennings Disobeys Coach’s Orders to Stop Talking about Green Bay Packers. Is Still an Idiot! Poll! Would You Rather the Packers Bikini Girls or This Old Woman? So this one ought to be fun! We are talking about “the” Green Bay Packers Bikini Girls here! These girls go to every Packers game at home in their bikinis, yeah that includes December and January games at Lambeau Field, you know the Frozen Tundra! I saw them for the first time back in December of 2004, which was my first Lambeau game. It was so cold out that when we took the beer out of the van to unpack the grill, it froze in 10 minutes! Yet these ladies were in their cheesehead bikinis. This lady is a BAWSE right? 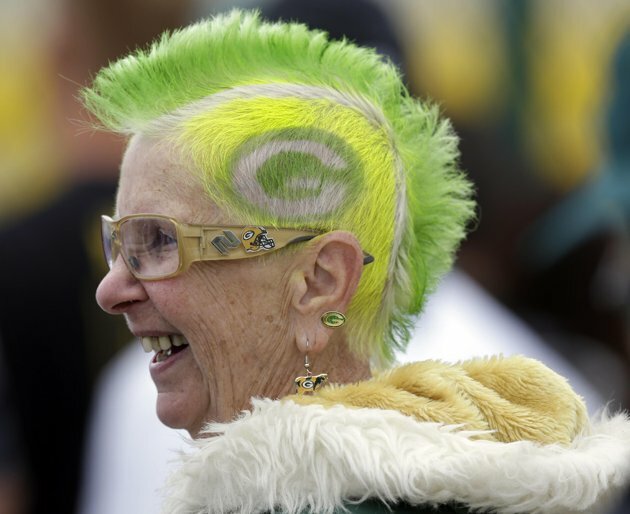 Yup, I’m 75 and I have a green mohawk with the Packers logo dyed into my hair. Oh, and I have two ear piercings with two different Packers earrings, not to mention the stylish Packer glasses. (Those are not sunglasses boys and girls, that is everyday eye wear!) To be honest this lady had to be the original bikini girl right? Back in her younger days when football players didn’t wear face masks, you know she was in the stands wearing her pin-up Packers outfit! I’m taking this lady for the win! Yeah, the bikini girls are insane and are decked out, but this woman is still rocking it! I don’t see how you don’t pick her! So the three bikini girls vs old mohawk lady, who you got? Packers Training Camp Tradition is the Best in the Business! Every day during the Green Bay Packers training camp, there are hundreds of children with their bikes lined up just hoping that one of the players will pick them! 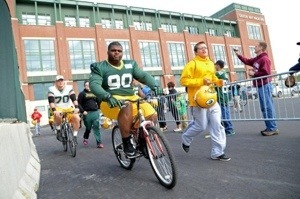 Each player rides from Lambeau Field to their practice at Ray Nitschke Field House on a child’s bike. This tradition was started back in the Lombardi years in efforts to have the team be more active in the community and hasn’t stopped since. It seems like it is just as exciting for the players as it is for the kids! 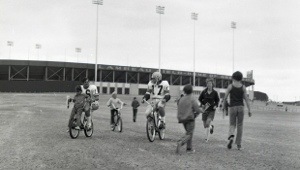 In this 1973 photo provided Aug. 30, 2011 by the Wisconsin Historical Society, Green Bay Packers quarterbacks Jerry Tagge (17) and Scott Hunter (16) ride bicycles loaned to them by young fans from Lambeau Field to their practice field during training camp in Green Bay, Wis. 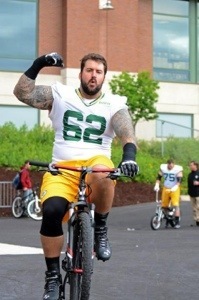 So here’s the deal, I’m 33 years old I think I could get one of the players to ride my bike! I should make it a goal of mine to get to Packers training camp and make it happen. I don’t have any in-person autographs so let’s skip that and just go big or go home! I need to get to another Packers game in Green Bay!